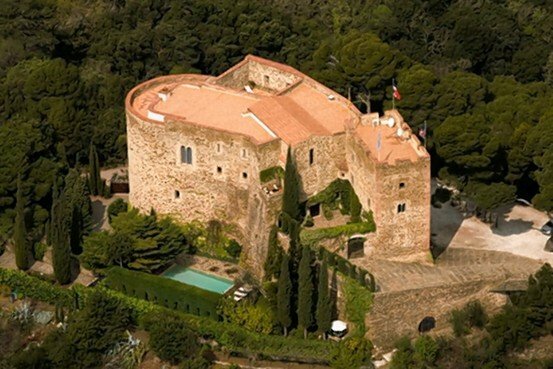 Located in southern France, near the city of Perpignan, Château de Corbère is a 7000 sq ft medieval castle. Throughout most of the Middle Ages this land was part of Crown of Aragon, but by the 17th century it was ceded over to France. The origins of the castle likely date back to the 11th century, and during the 13th and 16th centuries the castle was renovated and expanded. It’s most recent owner worked to restore and modernize the estate, even adding a swimming pool. Château de Corbère was first put on the market back in 2012, and the asking price has gone down over the years. The castle has 14 rooms, including 8 bedrooms, and features a heated flooring system throughout and 6-foot-tall windows in some of the bedrooms. There are also four terraces which offer excellent views of the surrounding countryside. The local mayor adds that castle could make an excellent hotel or bed-and-breakfast. Tranquil, secure and private though not isolated, this elegant chateau-fort would suit a couple, family, boutique hotel or conference center. For entertaining there are four grand rooms, cozy sitting rooms and a flowered courtyard. Outside near the heated pool are terraces with cascading fountains, a sunken Italian garden and a pergola, all dramatically lit at night. Bordering the pool are lovely lemon trees, a cypress hedge and a wall festooned with roses. There is room for elevator, helipad and tennis. Along with international transport there are renowned beaches, skiing, and miles of wilderness trails, all nearby. It is what we all dream for ourselves. As an added bonus, the owner of this castle also receives the right to be called Baron.